• All students are required to learn and follow the Dojo Rules. • Karate parents must personally drop off and pick up all students under age 13. • Students are to bow upon entering or leaving the Dojo floor. • When you first arrive at the Dojo, and before stepping onto the Dojo floor, please remove your shoes and socks. • Always wear shoes if you need to leave the room for any reason. • Please make sure you go to the bathroom before you come to class. • Plain white Karate uniforms (Gis) must be worn during class. • Your Gi must be kept clean & neat, but DO NOT wash your belt. • Men/woman — remember to keep your finger and toe nails neat and trimmed. • Please no watches, rings (wedding or engagement), silly bands or any jewelry in the dojo. • Men — NO earrings in the dojo. • Women — please no dangling earrings in the dojo. • For sparring men and women should have mouth guards, hand and feet protection (white foam traditional pads). NO MOLDED HAND OR FEET GUARDS ARE ALLOWED in dojo sparring; unless approved by Sensei. Head gear is optional and will be provided if needed. • Men should wear a protective cup during class whether or not there is sparring. • Always warm up before training and warm down after training. • Respect the property of other WSKC students. Do not touch anything that does not belong to you. • You are not allowed to laugh at mistakes made by other students. • The Karate techniques you learn here are NEVER to be used to start fights. You are ONLY to use the Karate techniques you learn in class to defend yourself. • ANY STUDENT WHO BULLIES OTHER STUDENTS OR ANYONE ELSE AT ALL WILL NOT BE ALLOWED TO CONTINUE TRAINING. • Karate students should arrive for class (outside the dojo) at least 10 minutes before your scheduled class time. If you arrive more than 5 minutes before your scheduled class time do not go into the training area (another class may be under way). Sit quietly outside the dojo. Stay quietly in the hallway outside the dojo unless you are instructed to go into the training area by one of your instructors. • If you are late to class please enter the dojo, kneel at the door ready for class. Wait until the Sensei calls you into class. Before entering do 10 pushups before joining the class. • Students will learn the Japanese words and phrases used during class (you must recognize the basic Japanese terminology before you will be allowed to take your first rank examination). • Practice your Karate at least 10 minutes every day. • Students are responsible for helping to keep the Dojo clean. Brown and black belts are responsible for making sure the dojo is clean and ready for training. Proper etiquette is essential as it signifies your commitment and appreciation for an important aspect of Japanese culture that you have chosen to practice. Observation of etiquette indicates your sincerity and willingness to learn, and your trust and respect for yourself, your classmates, and your instructors. Whether you are a beginner or an advanced student, you are equally responsible for following these simple dojo rules (Reigi-saho). If you are a beginner, think of them as the basic building blocks of your journey into the rich world of karate. If you already have been practicing for a while, think of these as a vital aspect of your strive for technical perfection. Never lose sight of what karate is in the first place — it has no place for arrogance or ignorance. When in doubt, think back to the basic tenets of the Dojo Kun. A. The command to “line up” or “seiretsu” from the senior student, run to the end of the line which will form facing the front of the dojo. Stand next to the other beginners, shoulder to shoulder, at attention — the line of students will form, from left to right, with the beginners at one side and the advanced students to your right, facing Sensei. B. At the first command, “seiza,” kneel. Place the left knee on the floor, then the right. Sit on your feet with the big toe of the right foot overlapping that of the left foot. Maintain a nice posture, back straight, head straight, shoulders relaxed, looking straight forward. Rest your hands (open, fingers together) on each respective thigh with the fingers pointing slightly inward. Keep about a two fist distance (men) or a one fist distance (women) between your knees. D. At the third command, “mokuso yame,” open your eyes. E. At the last two commands, “sensei ni rei” and “shomen ni rei” bow in the kneeling position together with your classmates. F. At the signal of the instructor, wait until the person to your left has risen before you quickly get up from the kneeling position. A. After “mokuso” the senior student will recite the Dojo Kun, line-by-line, allowing time for the class to repeat it out loud in unison. 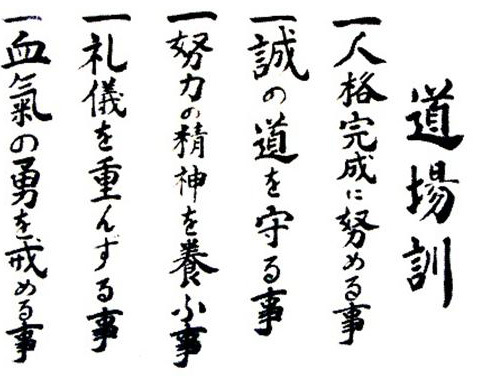 C.Dojo Kun: Dojo kun is a Japanese martial arts term literally meaning dojo (training hall) rules.They are generally posted at the entrance to training halls or at the "front" of the dojo (shomen) and outline behaviour expected and disallowed. In some styles of martial arts they are recited at the end of a class. An essential aspect of the Japanese culture that signifies respect and acknowledgment. Bowing is the utmost show of trust Without exception, bow to those senior to you - out of courtesy, bow to your peers. Bow whenever you enter or exit the class, when you get a new partner for any exercise, and again when you finish that exercise. A. Bow when Sensei enters or exits the dojo. B. Standing bow: With your heels together and the feet pointing slightly outward in a “V” shape, face the person you are bowing to (or the class) and bend at the waist. Keep the knees and elbows straight, and the hands open with the fingers tightly next to each other and over the seams of your pants. Do not bend more than 20 degrees or so and take about a second or so to bow. C. Kneeling bow: Slide the left hand first, from your thigh to the floor. Place it, palm down in front of the left knee, about a fist or two away. Then slide the right hand in the same manner and place it on the floor so that the two index fingers touch and the two palms form a very slight inverted “V” shape. Bow at the waist but do not let your head touch the floor. Slide the hands back to their original position, this time in reverse order - first the right, then the left hand. Spirit is shown through effort and through “kiai”. A loud kiai is the perfect display of powerful spirit. The choice of sound and/or word is yours. The purpose of the kiai, however, is to release energy and relax the upper body muscles so that the technique is powerful and sharp. Words and sounds ending in “ah” sounds therefore better serve this purpose. Don't be afraid to kiai loudly as this displays good spirit and will motivate everyone in the class, but never do it half-heartedly. Movements performed at half-speed are typically not accompanied by a kiai. Movements at full-speed, however, are always performed with a loud kiai. Kiai on every 5th and 10th technique of any set, and definitely when Sensei asks you to! There is a time for everything. Do not interrupt the class unless the instructor invites questions. Focus on what is being taught and you will be surprised how much you can learn even if you cannot fully grasp the techniques being shown. Make a mental note of your questions and remember to approach any of the senior students before or after class. Listen and you will learn. Do not argue or try to excuse yourself for a mistake or a deficiency that the senior student tells you about. Karate is not about being embarrassed about your mistakes — rather about taking pride in your achievements. Take in all that you are being told, practice it on your own, then return with more questions if you have them. More often, you will find that everything makes sense once you put effort into it! Bow after receiving guidance and thank your mentor. Respect your class and your instructor. Come to class a few minutes early (if not earlier) so you can change and stretch. Run into position when called to but don't run in front of a senior student, cross them from behind and around. If you must be late, enter the class quietly, kneel near the entrance and wait until the instructor acknowledges you. Then bow while still kneeling and run to join the group. Be the least disruptive you can be. If you ever arrive just as the opening sequence is being performed, stand motionless at the entrance and wait until the warm-up begins to kneel. If you ever need to leave class early, let the instructor know ahead of time. When the time comes, do not disrupt the class and bow on your way out. Remain focused and silent during class. Do not fidget, turn around, look around, talk with your classmates, yawn, or fix your clothing during class. Face and pay full attention to your instructor as he or she is talking to you and/or the rest of the class. If you have to yawn, scratch an itch, fix your gi, or anything else with or on your body remember to turn around and do it. Before turning around, first bow to the front, then bow to the rear, perform the action, then bow to the rear, and turn back around to the front of the classroom and bow again. A clean gi, trimmed finger and toe-nails, and the removal of all jewelry are absolute musts. Present the physical picture that you want your classmates to present. Put all daily frustrations and excitements aside and you will find that training will help you relax and focus your thoughts. Listen to your body. Don't make unnecessary displays of fatigue, discomfort, or pain. If you have an injury, make sure you are in good shape to train before you decide to do so. Cover any cuts that you incur prior to, or occasionally during class. Step to the side if you are not feeling well. “Pushing it” is definitely a show of good motivation, but doing so to a point of injury is not proper etiquette. Treat it like an opponent. Part of your practice is to react to it as fast as possible, the same way you would to an opponent's move. Jumping the gun confuses your classmates and is poor training for you. Always for your own benefit! Also, out of respect for your sparring partner, no matter the rank do your best. When facing lower-level students, show spirit and practice good control. When facing your peers or higher-level students, practice good focus and timing. This is as much training for you as it is for them too. Understand that rank is all about responsibility, not about privileges. As you gain more experience and move up the ranks, consider it your duty to be a role-model for those that follow. It rests upon you to show others the way. Show proper etiquette if you expect others to do the same. Remember showing respect does not matter if the senior belt is younger then you. During class, follow your fellow students and copy what your instructor shows you. XIV. Whenever a command is given, shout “hai” (Yes) or “osu” (I understand) - show enthusiasm! With these things in mind, you and your classmates will enjoy many fun and exciting training sessions! Remember to always try your very best!